Good morning everyone! 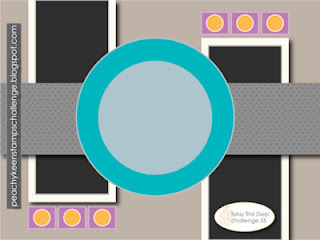 I'm excited to say that I'm a guest designer for the Peachy Keen Stamps Blog Challenge #35. This challenge is a dual challenge. There is a sketch and a color combo to be used together. As you can see, I turned the sketch vertically so that I could utilize a Double Slider technique. The little monster is basically the same as my Monster Mash without the horns. The circle in the center of the card is 4" in diameter. It's just large enough to cover the slider slots. 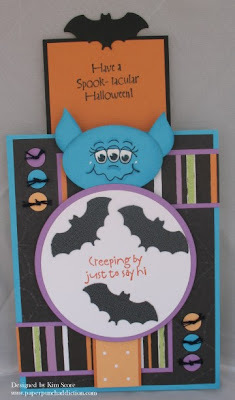 The face on the cute little monster is Peachy Keen stamps, of course. It is from the Monster Mash Face Assortment. I added some white to the eyes with a white unibal gel pen. Hi Kim! It's great to have you with us this week! I LOVE your blog and the artistry with which you use punches to create all things cute and clever! I've put your blog on my desktop so I don't lose you, as your creations are awesome. I will be back many times over! 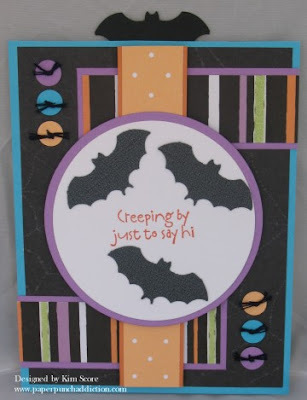 LOVE this Halloween card. It's a stunner! Good morning, Kim! It's so great to have you join us this week, and I absolutely love your monster card. Your blog is an inspiration and treasure, and your creations are absolutely amazing!! Love this surprise - I was wondering what fun element it would have - I was not disappointed. Cool! Wow! What a terrific card!! I would love to make several of these for my little nieces and nephews! So cute!!! I am so sorry it took me this long to get here! I LOVE YOUR work Kim! You have managed to win my heart! I adore paper piecing and you do AWESOME work! THANK YOU EVER SO much for guest designing for us! I have to tell you that your blog was the top referring blog duirng our sale!! Hello Miss Kim!! It is GREAT to have you as a Guest Designer for the BEST Stamp Company in the WHOLE WIDE WORLD! Your card is just STUNNING my friend!! Finally getting to your blog. Congratulations for making the PK guest designer. This card is so adorable! I love everything about this card! Like Viv, I have added your blog to my desktop! You do great work!